Swing Catalyst is a great product not only for swing but also for impact. It'll be nice if you guys can allow more fps than 500. Trackman software supports it and it's great to see some club impact too. So that Swing Catalyst can capture swings as well as club/ball impact all at the same time. So you can measure attack angle, club path, face angle, swing direction and so forth using high speed camera. What you will need is something like a Phantom camera app where you'll be able to put down the impact point, then follow that point through the video to see the angle difference. This will help greatly for students too to capture true club path if they don't have a launch monitor to compare for instance. It looks like when used with Foresight or Trackman you can only view particular data in different windows. I wish you can see the entire numbers in one screen, e.g. in a table format. So you can see the entire data as well as averages within Swing Catalyst screen. Instead of having to see the entire video, it would be nice if I can highlight a certain area (i.e. from top to impact rather than from address to impact) and loop that part. I want to highlight the impact part only and currently the software doesn't provide that. 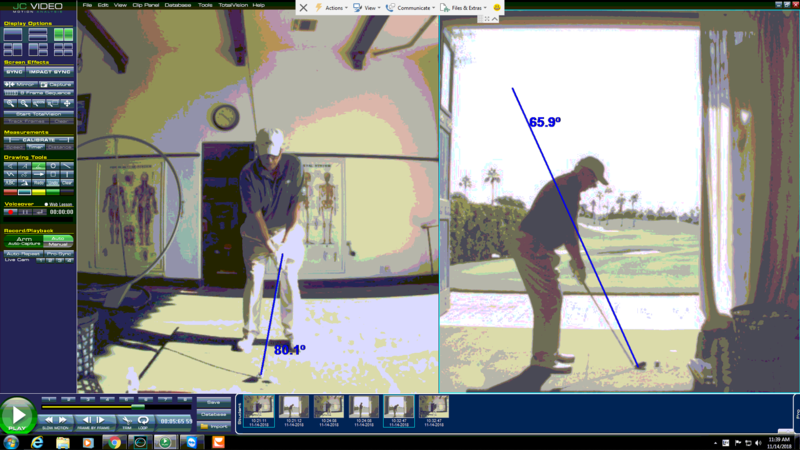 While capturing swing videos, I understand that all data (ball/club/balance plate) is stored together with the video. However this data is not displayed (even when the the option to view the last swing once before capturing resumes, is selected). Ideally the data (from external hardware) would be echoed regardless if capturing or not. This would allow real time analysis without the necessity to follow other sources e.g. Tracman and Foresight software. In addition the options for (monitor) data windows are grouped by type (e.g. ball, club, path, flight). It would be more usefull to have a more complete (monitor) data window especially in the data centric view option where all/most or even better a user selectable set of data would be displayed e.g. clubhead speed/path/angles, smash factor, ball speed/spin/spin axis, ball flight graphics (including off-line and distance figures). The additional window (for multi-monitor setups) should also have options to add data besides the video image (e.g. balance plate view as commented earlier). When immediately playing back the video after player swing, please also show pressure/sensor board info for that swing on playback. Currently it is not there and you have to go into the actual swing video to get any of the pressure/sensor board data. It shows it during the actual player swing while it’s recording. Why not play it back on the video replay right after??? When integrated to GC2 the captured video has a lengthy period of non action prior to the actual swing. On the other hand someone commented that on Tracman the auto-capture feature misses the start of the swing. It would be nice to be able to adjust the duration/timing of an auto-captured video e.g. in Capture Options. I purchased 9 Foot Pedals and MAde them into a keyboard that I can use to control Swing catalyst video review, much like Golftec does but they use pushbuttons instead of foot pedals, you can review your last shot without having to walk to computer or have a coach at computer, you foot pedals next to hitting matt. However, there is one shortcut key missing and that is Resume Capture. JC Video has a mirror tool to change a right handed player to left handed or vise versa. This tool is essential when working with left handers, I can swing right handed and flip my video to left handed for comparison. I would like to see the drawing tools improve. It would be helpful if we could click manual record and record for as long as we want to, or up to a certain time. I know we can manually trigger a recording, but if I want to catch more of the routine it is not possible. we use Edufii to document our students progress. and if possible I think this would really enhance the app. it would be helpful if we could trim a video we import from a video camera. It would be nice if the system defaulted to the new player added instead of going back to the general database. When coaches and players send me swings through the SwingCatalyst cloud it would be extremely useful to have a voiceover option in order to explain any thoughts regarding the shot. Especially when access to the main pc system for the sender or receiver is not possible due to travel or location. The competitors offer biofeedback so that you can match feel with real! You can set parameters for the tone to come on if you hit the corridor.